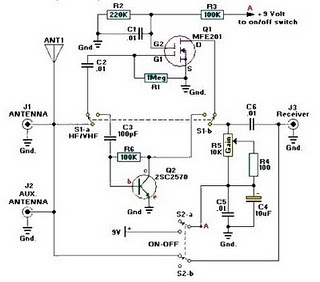 A very simple and efficiency active antenna electronic project can be designed using this electronic schematic circuit that is based on transistors. This active antenna electronic project is useful for a wide range of RF frequencies covering three RF bands HF , VHF and UHF . This simple active antenna is designed to amplify signals from 3 to 3000 MegaHertz, including three recognized ranges: 3-30Mhz high-frequency (HF) signals; 3-300Mhz veryhigh frequency (VHF) signals; 300-3000MHz ultra-high (UHF) frequency signals. S2 is useful to give to receiver nonamplified signal access to the auxiliary antenna jack, at J1, as well as the on-board telescoping whip antenna.